Over the past several years I’ve been looking for a high quality auto sunshade for Goose. I wanted one that would stay on yet not become a projectile in the event of a car crash. I have been having quite a time finding one. If I found something that would be safe to use, I couldn’t get it to stick to the window. If I found something that would stick, then I realized that it would become a projectile. In my search, I was made aware of the ShadyBaby by CG Babies. These shades are awesome!! Here is a photo of the sunshade in my Hyundai Santa Fe. As you can see, it provides enough shade for my daughter’s Britax Pinnacle 90 car seat (love that seat too). The shades are also really easy to install too. All have you have to is press them on the window, and they stay. I would assume that you would need to make sure you window is clean before applying, but I personally didn’t do an cleaning before applying, and it worked just fine. Another thing I really like about the ShabyBaby shades are, they are really easy to see through. So you don’t have to worry about having that blind spot while driving. Overall, these are awesome shades, and I would recommend buying a pack of them. They come in a pack of two at the following link http://goo.gl/jrHcIw, so unless you have a third roll of seats, one pack should be penty for one car. The only place that I’ve seen these for sale are on Amazon, but are available for free shipping if you have Prime. So go check them out today. Role playing has always been one of Goose’s favorite play time activities. We play doctor, vet, restaurant, and like we are at the store pretty much every day. The Shop and Learn Cash Register has quickly become one of Nora’s favorite toys. As you can see, she is having a blast putting the coins in the pay for her purchases. The Shop and Learn Cash Register comes with plenty of pretend food and money (including a credit card) to keep your little one interested for quite some time. Not only is this toy fun, but it is also educational. 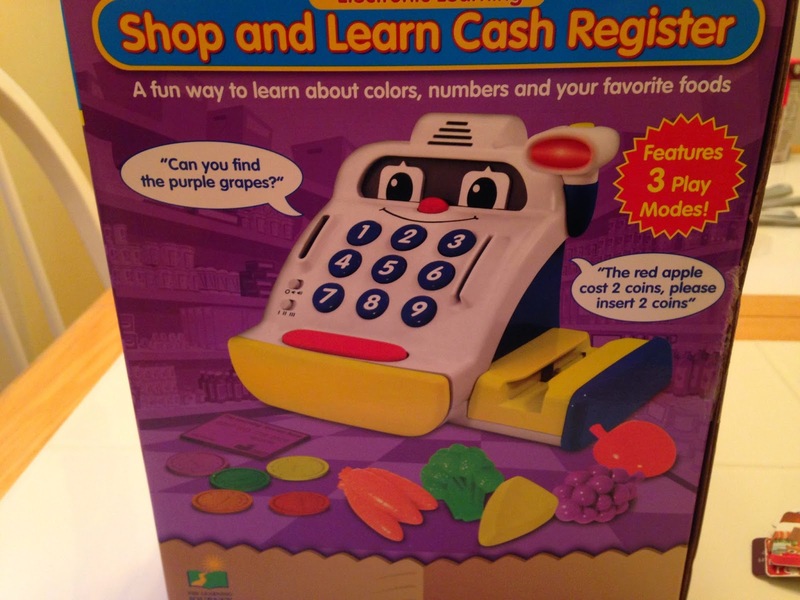 There are three learning levels on the Shop and Learn Cash Register. The first level is very basic. When you put in the coins it just counts them, or when you slide a piece of food over the scanner, it just tells you what it is. The next two levels get a little harder. Here is a video about each level. 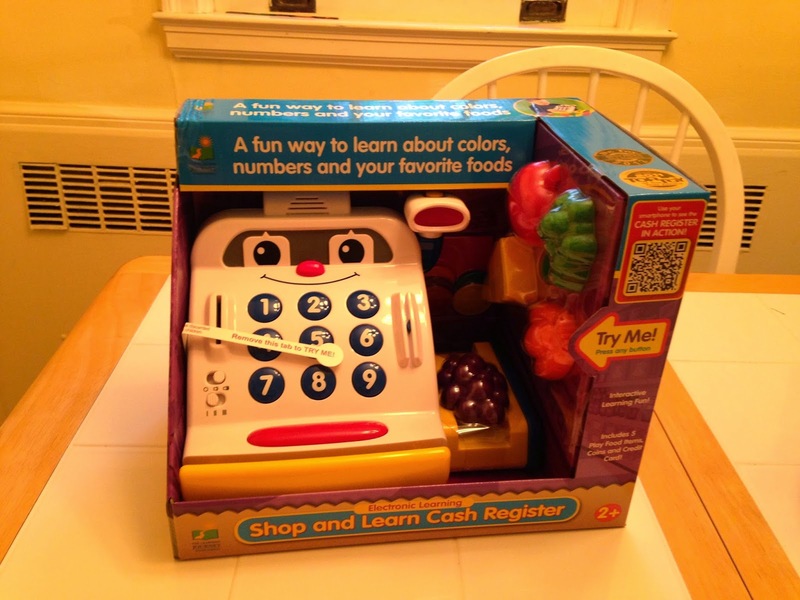 Overall, we love the Shop and Learn Cash Register. It has made for some very fun play time, and has kept Goose very busy while we recently moved. The only problem we have found is, there is only two sound volumes; loud and very loud. I wish there was a way to make the sounds a little quieter.